for traces of some meaning it might hide. of one small child’s loss bent easily. This poem is by Pete Hulme and is posted with his permission. Pete’s original post of this poem is from his Everybody Means Something blog. Mary is a heartbreaking poem of loss and regret, the more so since the writer, being so young clearly does not yet know how to access or process such grief, and yet is, in his own unique way, bound to it, making the double hurt all that much more poignant. Thus always is the pain of such innocents. Thank you for reading Pete Hulme’s “Mary”. I sincerely hope you have enjoyed it and I humbly appreciate your visiting the Book of Pain. As always, I look forward to your comments. Comments © 2014 by John Etheridge; all rights reserved. Poem © June, 2012 by Pete Hulme; all rights reserved. who came to the soul, to the deep sky? is life in the old and new order yours? working for the dust and the wind? Besides the unifying theme of struggle leading, in the end, to the wind blown dust, the reference in Pete’s poem to the idea and style of Machado’s work is clear—both are filled with a full measure of heart-filled anguish by one who has loved truly and deeply. Moreover, both poems ache so perfectly that it is not possible to read either (even in the Google translation) and not ache with them, for both talk of the essence of what it is to love and to love in life with an intensity that catches the breath and fixes the imagination. However, to consider Pete’s poem a slavish imitation to the original would be very wrong, as he adds, I think, two essential elements that are his own: that the love he has born, being human, has not been born perfectly; but that, still, beyond this, this love he has borne has transformed him sufficiently to glimpse the mercy of the Divine. These added elements are more than beautiful and worthy sentiments, they are at once sublime in their cohesiveness, approachable by the least among us and transformative for those who can mine the core of humility buried in the depths of the poem. For me, it is a poem that only improves over time and grows sweeter to the tongue with each re-read. What is more, I suspect that Antonio Machado feels that way too. 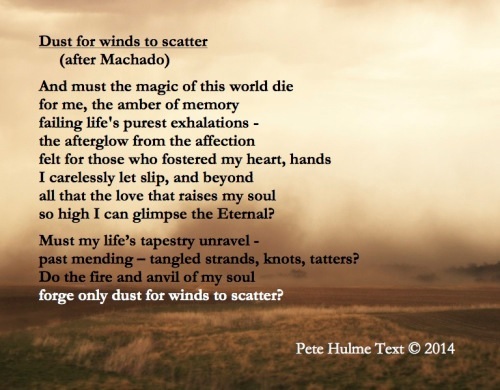 Thank you for reading Pete Hulme’s “Dust for winds to scatter”. I sincerely hope you have enjoyed it and I humbly appreciate your visiting the Book of Pain. As always, I look forward to your comments. 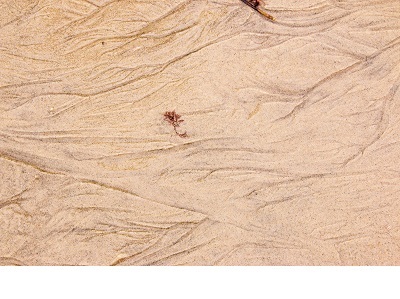 Comments © 2014 by John Etheridge; all rights reserved. Poem © 2014 by Pete Hulme; all rights reserved. Oddly enough—for me, anyway—it is used by permission of the author.